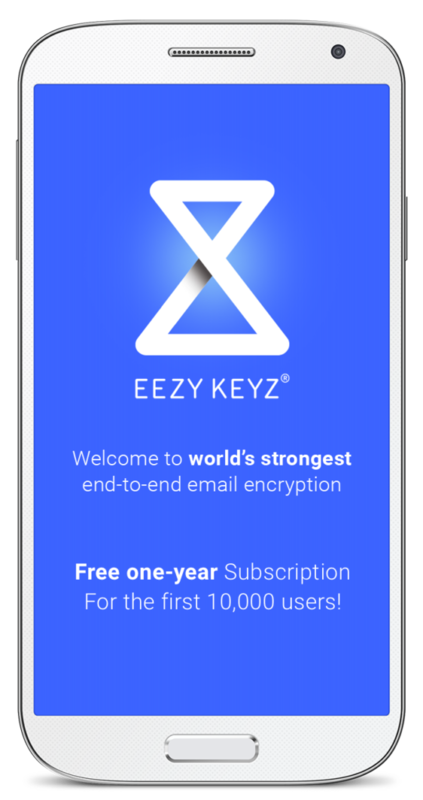 SPECIAL DEAL FOR EARLY ADOPTERS We have decided to reward our first private users with a significant first mover advantage: we are offering a free one-year subscription to the first 10,000 users who download our EEZY KEYZ end-to-end email encryption software! We do not require any of your personal information or payment details in order for you to take advantage of the free subscription deal. Neither are you required to commit to any paid plan after the free one-year subscription has ended. Just download as many of our Outlook plugins and mobile applications (Android & iOS) as you wish and start encrypting your email. During the one-year free subscription, you can enjoy all the same features and updates of EEZY KEYZ end-to-end email encryption software that a paying customer would. After the free subscription expires, sending encrypted email is no longer possible without upgrading to a paid license. Upgrading to the paid version can be easily done from our webstore. However, you can continue to receive encrypted email and send unencrypted email for free, even after the free subscription expires. In exchange for this offer, we would like your feedback and comments on EEZY KEYZ end-to-end email encryption software so we can develop and improve it further! We have just recently launched our software and acknowledge that there is still work to do. Up to this point we have mostly focused on making sure that the core of our solution; end-to-end encryption is solid and works as it should. What we need the most now is your comments on user experience and any feedback on how we could make EEZY KEYZ even more user-friendly. Developing a Cross-Platform end-to-end email encryption software that works with virtually any email service has been quite a complex task and there are certainly some use cases that we didn’t think to test out beforehand. If you are reading this, the chances are that you are above average interested and aware of email encryption so we would highly appreciate your feedback! Remember to invite friends, colleagues & family members also to try EEZY KEYZ for free (both the sender and recipient must have EEZY KEYZ mobile application or Outlook plugin installed to use the software for encrypted communications). Note: It is vital that you remember the passphrase you insert to create your secret private key. It is never revealed to us so we cannot reset it if you forget it!